Gas hot water systems burn either natural gas delivered via a piped network, or LPG, which is bottled. They can be a good solu-tion depending on your circumstances—for example, if you live in an area with limited sunlight for a solar hot water system or if a heat pump hot water system is not suitable. 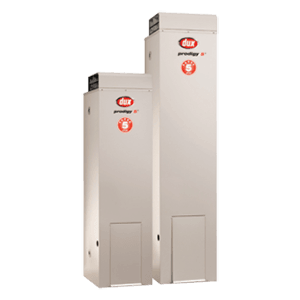 Gas hot water systems generally produce far less greenhouse gases than electric water heaters. 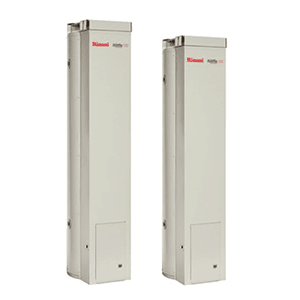 They generally also have lower upfront costs than solar or heat pump hot water systems. However, if you don’t have natural gas connected to your home you will need to get a mains gas connection or use bottled gas (LPG). Depending on how much hot water you use, LPG may be more expensive to run than natural gas. 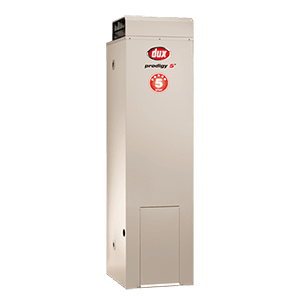 Storage heaters use a gas burner located under the storage tank to heat the water. They usually have a pilot flame that burns continuously and lights the main burner when it’s needed. Systems installed indoors need a flue. In an instantaneous system (or continuous flow system) there is no storage tank and the water is heated as required. The water is heated by a gas burner as it flows through a coiled pipe called a heat exchanger. The gas burner starts when a hot water tap is turned on. It only heats the amount of water that is required instead of continuously heating a full tank. A storage tank should hold a one day’s supply of hot water, the Gas storage tanks come in 135 and 170 litre. For help with selection please contact our free call number 1800 689 919 or you can simple fill in the quick quote form and we will be in touch within 1-2 hours (within business trading hours). Dux gas storage hot water storage tanks come in 135 and 170 litre storage capacities and come with 10 years warranty. 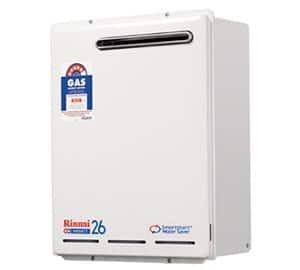 Rinnai gas storage hot water storage tanks come in 135 or 170 litre storage capacities and come with 8 years warranty. 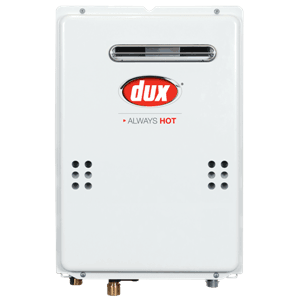 Dux instantaneous units some in 16, 20, 26 and 32 litres/per minute capacities and come with up to 12 years warranty. 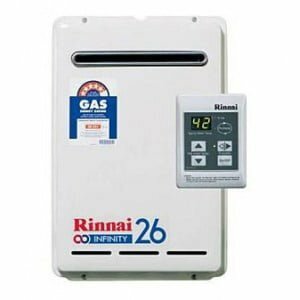 Rinnai Instantaneous units comes in 16, 20 and 26 Litre/Per minute capacities and come with up to 12 years warranty.